Frank Gore is the running back for the San Francisco 49ers and was picked 65th overall in the third round of the 2005 NFL Draft. 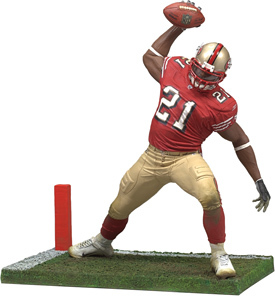 Frank Gore had a huge 2006, but he came back to Earth in 2007. That means most fantasy owners who drafted Gore last year were disappointed. Some point to the loss of offensive coordinator Norv Turner for Gore’s drop in production (it might have had to do with the loss of two starting linemen, too.) Just as important, Alex Smith (the QB) regressed and the passing game was terrible. The Niners were picked by a lot of people to be a playoff contender, but they floundered for most of the season. So Gore dropped a few spots down draft lists this year. There’s reason for hope, though. The Niners picked up Isaac Bruce and Bryant Johnson as free agent wide receivers. Paired with Vernon Davis (the tight end), Alex Smith has several targets to throw to, now. Alex Smith no longer has any excuses. If he can turn it around and live up to his being the #1 overall NFL Draft pick from a few years ago, then the Niners offense could improve. 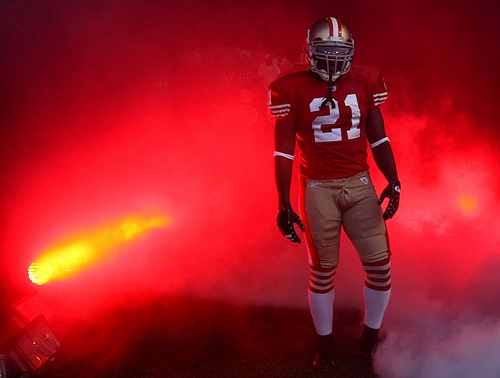 Whatever the case, Frank Gore will be the centerpiece of 49ers offense in 2008, just like in recent season. In reception leagues, Frank Gore could have a good season, certainly enough to warrant a 1st round pick at the bottom of the first round. Gore has a long injury history going back to two major knee injuries in college, so a lot of owners will shy away from him. But keep in mind that those injuries are several years in the past, and Gore is only 25 years old. Gore attended the University of Miami and as a true freshman he had 62 carries for 854 yards with eight touchdowns prompting him to be named Sporting News� Big East Freshman of the Year. Frank Gore bounced back from the ACL tear and the following year put up some impressive numbers. He decided that he would play his senior year and he had a great season rushing for over 1,000 yards during that year. He then entered the 2005 NFL Draft and was picked 65th overall by San Francisco. The reason for him slipping so far down was a combination of the history of significant injuries and a poor 40 time for an NFL running back held at the NFL combine with a 4.68. The 2005 season saw Gore on the field 14 times, starting one game. He finished the season with a 4.8 rushing average, seventh among the NFL rookie running backs. The 2006 season saw him as the full fledged starter for the 49ers and he set two franchise records with 1,695 yards rushing in 312 carries and a total of 2,105 yards with the 485 yards he got receiving. He came in only second in the NFC to Steven Jackson and fourth overall in the entire NFL. For his amazing 2006 season, he was selected as the starter for the NFC Pro Bowl team. Last season, Frank Gore suffered a broken bone in his hand and he missed the entire pre season, then in September his mother passed two things thought to have slightly contributed to his below par season. This was more likely due to the poor passing games the 49ers have that can�t take attention away from Gore. Despite that he did end up 6th in total yards from scrimmage. St. Louis Rams fame has said that Gore will be the focal point of the 49ers offense, but seriously who else would it be? Alex Smith doesn’t appear to be the type of guy you build an offense around, even with Isaac Bruce, Vernon Davis and Bryant Johnson to throw at. Frank Gore would be in my Top 4 running backs to draft in 2009: in no particular order, Adrian Peterson, Maurice Jones-Drew, Matt Forte and Frank Gore. Frank Gore has gone in a couple or three short years from a major fantasy risk due to repeated knee injuries, to one of the surest and steadiest fantasy football performers in the game. That being said, Frank Gore is going in that 8-10 range in many mock drafts this summer. I’m guessing that fantasy football owners are concerned about Frank Gore’s lack of a quarterback and the departure of Mike Martz. The fact is, though, Frank Gore was productive before Mike Martz came aboard, and Frank Gore has done everything he’s done in the NFL without a viable NFL quarterback playing in front of him. Frank Gore has shown he can get it done in a situation similar to the one he’s in in 2009. In fact, I would argue that Frank Gore might be in a better position in 2009 than he’s played in for a couple of years. Mike Singletary acted a little goofy as the San Francisco 49ers new head coach midway through the 2008 season, but the act seemed to pay off. The San Francisco 49ers were a lot more competitive in the 2nd half of the 2008 season and the players seemed to respond. I wouldn’t be surprised to see the Niners put together a solid season in 2009. They continue to add to that small nucleus of talented players around Frank Gore, Vernon Davis and Patrick Willis. Veteran additions like Justin Smith seemed to help last year, while rookie additions like Michael Crabtree prove to be intriguing – at the very least. Mostly, Mike Singletary might well give the San Francicso 49ers a winning attitude. In his second year, I’m guessing the 49ers either make a solid if unsuccessful move to stay in contention for a playoff spot, or they don’t buy in and completely fall off a cliff. I’m guessing it’s the first of those. But even in the Niners stink again, Frank Gore has shown he can produce good fantasy statistics on lousy teams before. Martz., the new San Francisco 49ers offensive coordinator, has likened Frank Gore to Marshall Faulk, and when Faulk was under Martz 1999 through 2001, he was the fantasy football king. Gore has proven to be a great runner as well as a reliable receiver and pass blocker during his 3 year stint in the league. But since Martz has said Gore will be an every down type of player can his knees take it? DeShaun Foster has been brought in to be a backup in the running backs position and he might take some — probably not many — but some carries away. The offence is uncertain, but may be one of the contenders for the starting quarterback spot can turn up and if he becomes a good fantasy player, then Gore�s points can go nowhere but up. The second half of the season was much better for Frank Gore last year, enough so that he ended up as a Top 10 running back. The offense was so bad last year that there are few places to go but up, so if Gore falls to you expect to get relativity great numbers, and maybe even some outstanding ones.